Saudi Arabia, the United Arab Emirates, Bahrain and non-Gulf Cooperation Council (GCC) member Egypt cut diplomatic, transport and trade ties with Qatar in June 2017, accusing it of supporting terrorism and their regional foe Shi’ite Muslim Iran – something Doha denies. “When we have a common challenge, disputes between countries with shared objectives are never helpful,” Pompeo, who is on a tour of the Middle East, told a news conference in the Qatari capital, Doha. They never permit you to have as robust a response to common adversaries or common challenges as you might,” he added. Pompeo later told reporters that he had also raised the rift with officials in Bahrain, Egypt and the UAE. “It’s … not at all clear that the rift is any closer to being resolved today than it was yesterday and I regret that,” he said. 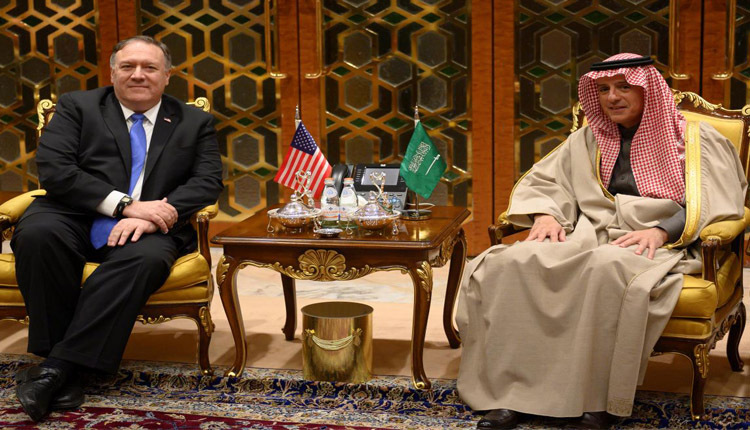 Arriving in Riyadh, Pompeo was greeted at the airport by Adel al-Jubeir, the Saudi minister of state for foreign affairs, Prince Khalid bin Salman, the Saudi ambassador to Washington, and U.S. Charge D’Affaires Christopher Henzel. “The secretary emphasized the importance of Saudi Arabia continuing its investigation into the murder of Jamal Khashoggi in order to ascertain facts, assess information, and hold those responsible accountable,” it added. Pompeo is also expected to meet with the kingdom’s Crown Prince Mohammed bin Salman, the de facto ruler known in the West as MbS, to discuss the investigation into Khashoggi’s death.